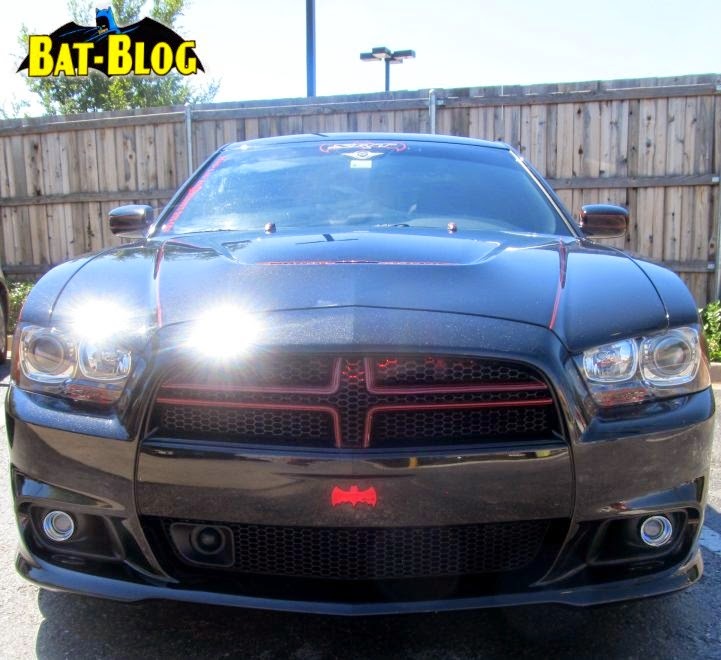 BAT - BLOG : BATMAN TOYS and COLLECTIBLES: Armando's Custom SERIOUS FAN OF BATMAN THEME Dodge Charger! 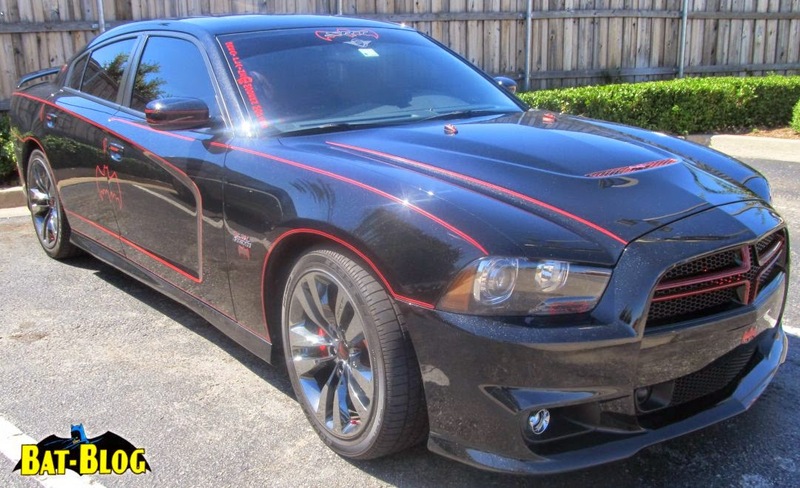 Armando's Custom SERIOUS FAN OF BATMAN THEME Dodge Charger! OK, Here's a pretty cool story that also turned out to be a lot of fun! 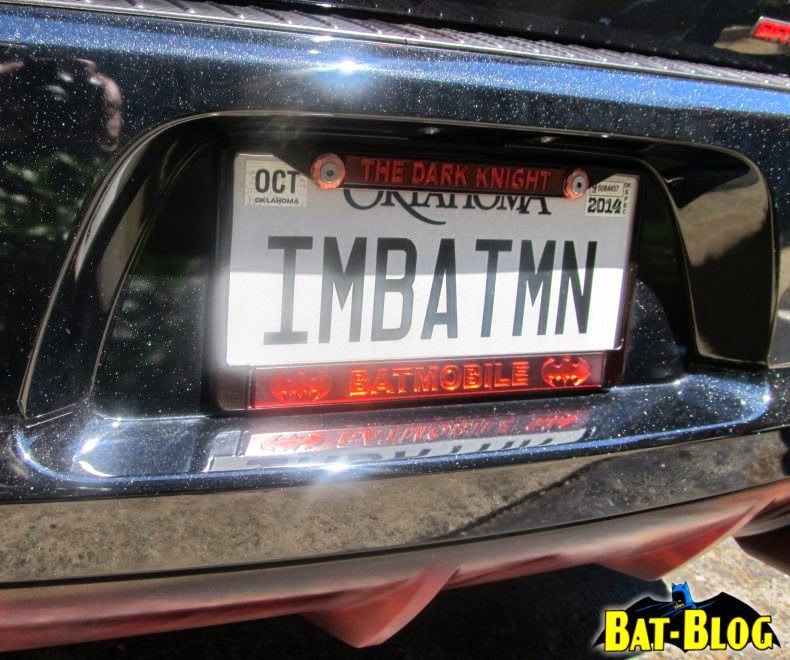 Awhile back I was hanging out at the Official Facebook Page for the BAT-BLOG BATMAN FAN SITE. While there I was contacted by a guy named Armando. 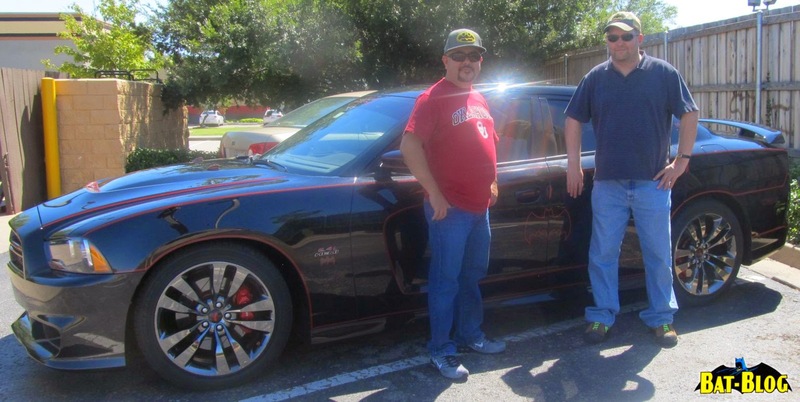 He had sent me a friend request and then later said, "Hey, check out my BATMAN Car!". I did and it's pretty amazing! Well, he then says something along the lines of, "Hey, I live in Lawton, OK and I have plans to come to Oklahoma City. Do you want to see it in person?" You see, OKC is where I live. "Oh my god, Yes!! ", I said, ha! We ended up meeting around 2:00 pm at a local McDonald's. That's Armando on the left, me on the right. Oh man, this car is even crazier in person! I mean, it's EXTREME!! 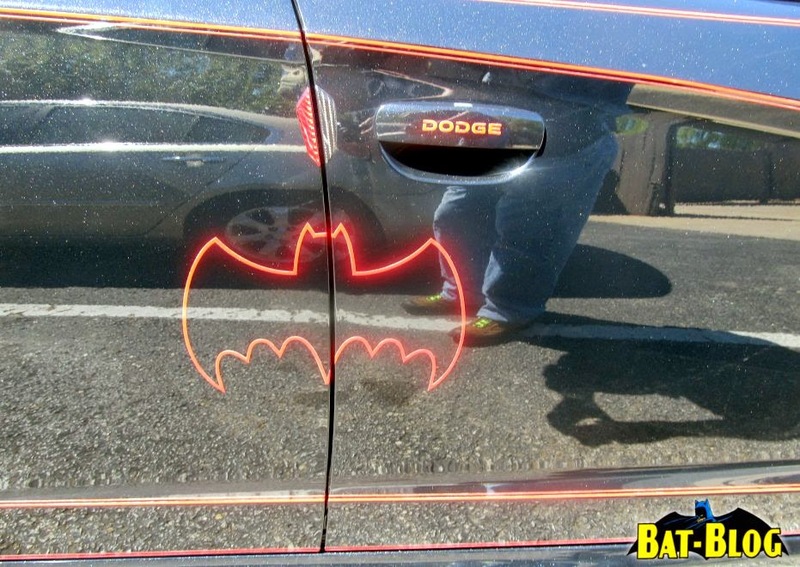 The first thing you notice is an amazing paint job. My photos don't show it well, but the car is sort of a sparkly-black color. Not quite sure how to explain it. 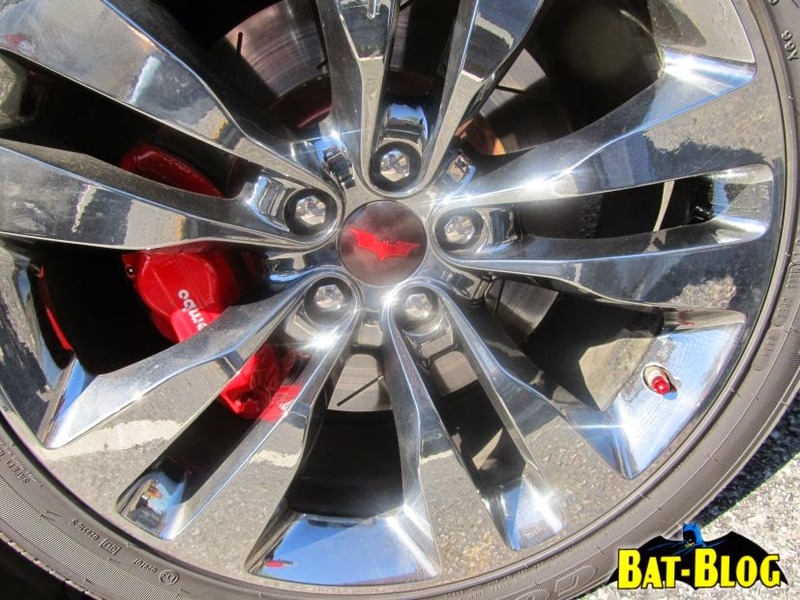 It's a little like metal-flake paint but toned down quite a bit, very subtle. It really looks more like an extremely DEEP black. 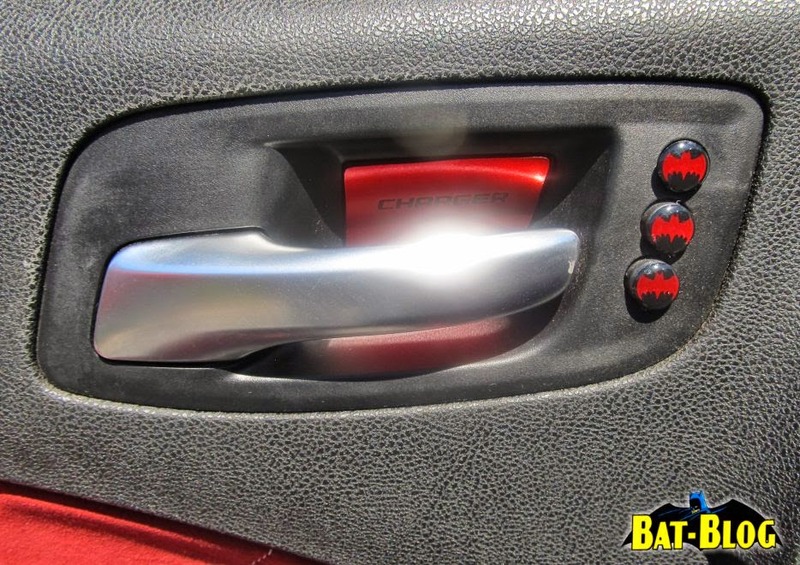 It has the RED BAT-SYMBOL on each door and RED Pin-Striping all over. 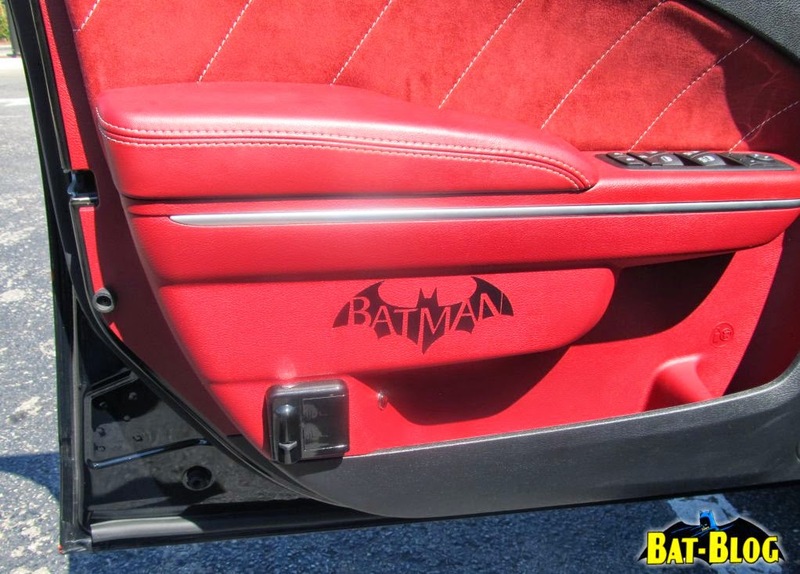 A nice tribute to the 1966 Batmobile by George Barris maybe? The main reason I have so many pics is because I went a little crazy. 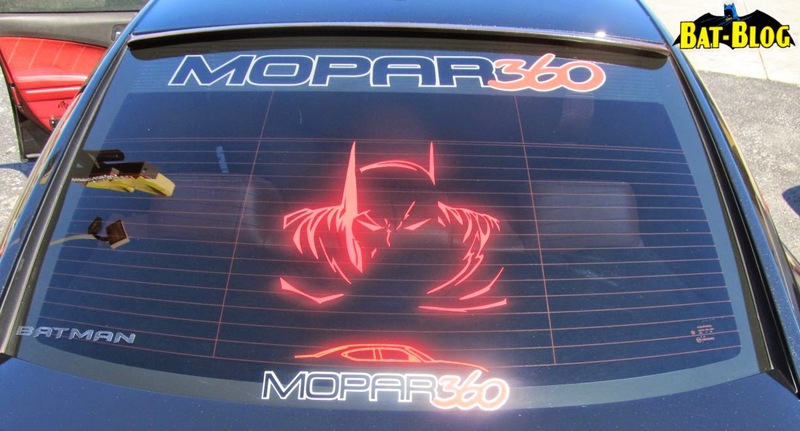 I mean, almost every inch of this car has a special "Batman" emblem or symbol some place. The attention to detail is insane! But overall it's just a lot of fun. 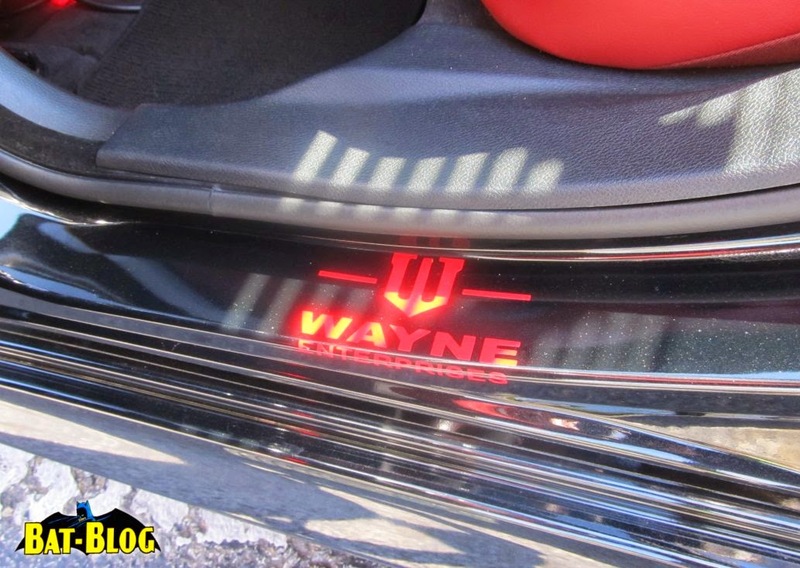 Some of the BATS are just vinyl decals but most of them are custom made pieces that are kind of like "clear-plastic bubbles". Sorry, not a good description but they're very well made, look crafted by hand too, sort of like clear jewels... really really nice! 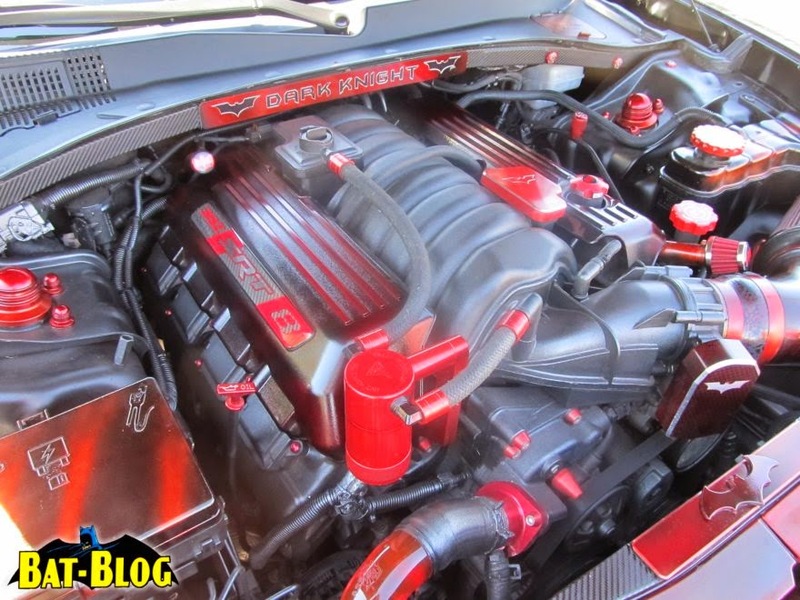 The 6.4 Liter HEMI Engine is all tricked out and there is even some neon lighting in there. This thing has gotta be crazy cool at night time! Oh man, you know, with color-changing lights shooting out of the front grill. 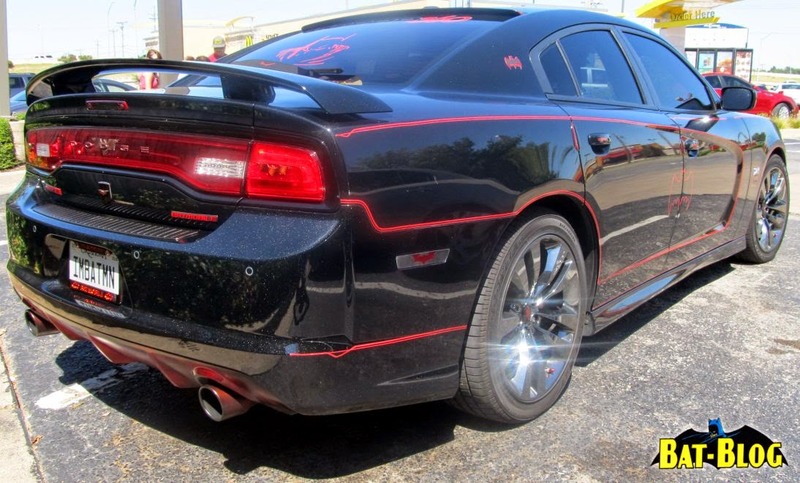 Armando said there was even NEON, under the car, as well. So, everybody please take the time to look at each photo, all blown-up in large detail (click on them). 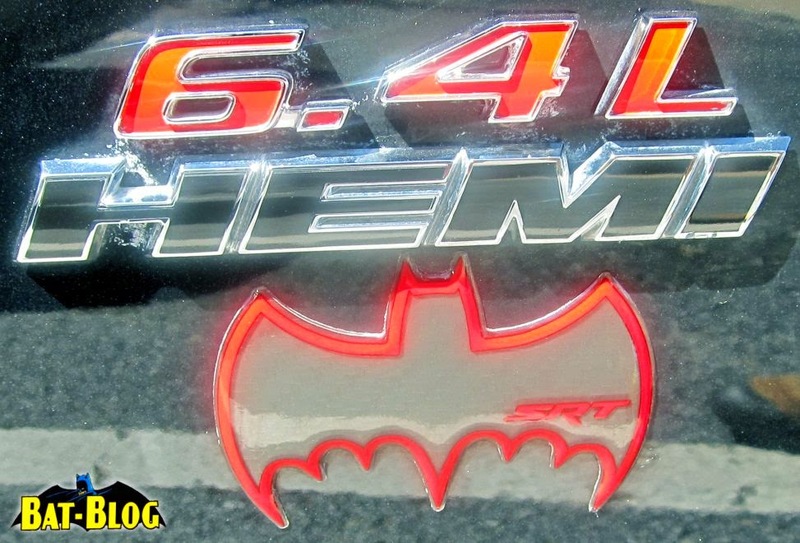 This car is extremely cool and if you're a serious Batman Fan you're gonna love it! 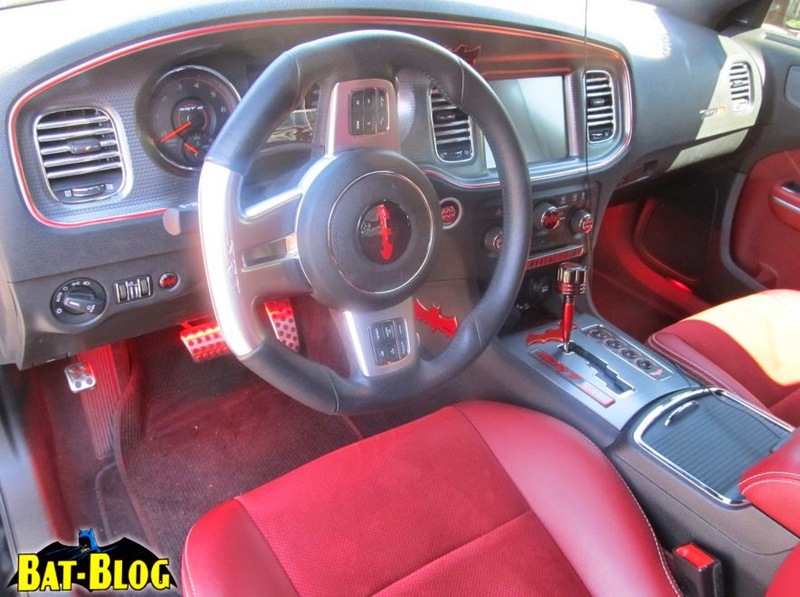 My favorite touch was the console cabinet inside the car. 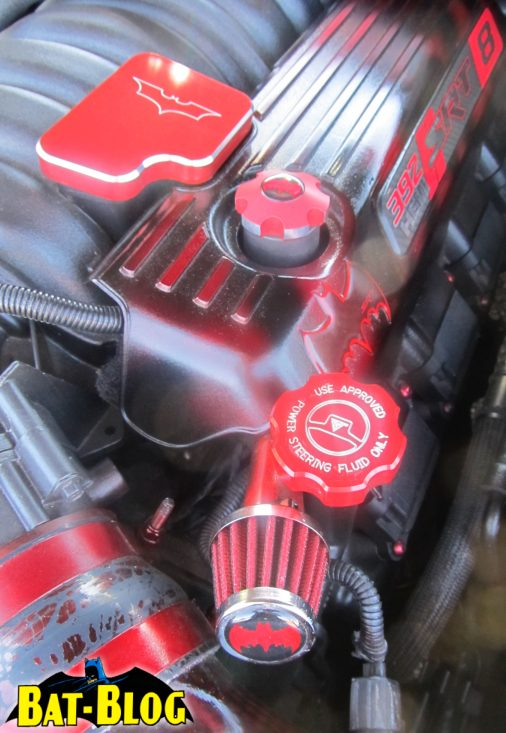 Just check out those pics and the details... fun stuff! 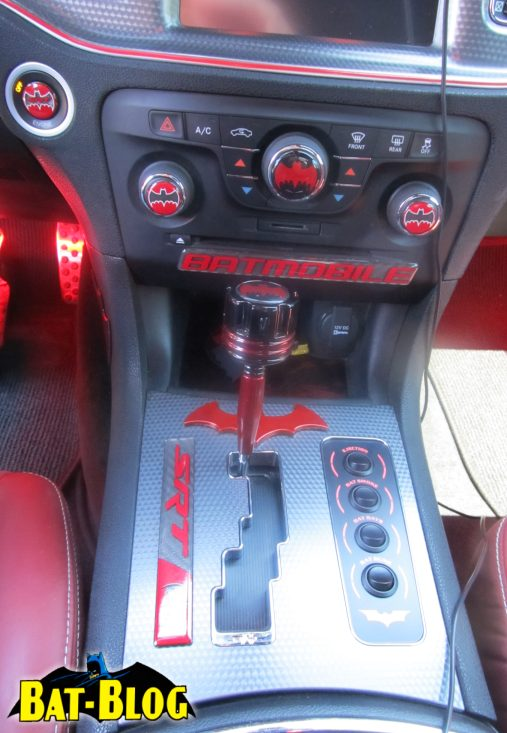 Thank you Armando for contacting me and showing me your car. I feel like I have made a new friend, Thanks!